Regionals Tuition with YOU in Mind. We are committed to making your Miami experience affordable. For Ohio Residents, you pay the same affordable in-state tuition rate at Miami Regionals locations. Learn more about tuition & fees at Miami's regional locations. Be sure to check out the grants that are available to teachers and others seeking financial assistance. Non-Ohio residents enrolled as E-Campus program students receive a special reduced rate of $350 per credit hour (inclusive of the E-Learning fee) for online undergraduate programs. Students must remain enrolled in an E-Campus major to be eligible for the special tuition rate. Online students are able to get the same quality experience at an affordable price. The Miami University Board of Trustees approved a fee of $35.00 per credit hour for all online and hybrid courses. The fee began with the Fall 2011 semester. Maintaining the currency and quality of our e-learning courses requires technical expertise and support beyond that typically needed in face-to-face courses. The money from the fee goes toward expanding and enhancing our e-learning offerings. Financial Aid refers to any number of ways to help finance your education. It can include scholarships, grants, and loans. Miami awards merit and need-based scholarships, and even more scholarships are available from outside sources. Some of our scholarships are competitive, others are awarded to students who meet minimum income or academic eligibility requirements. Need-based financial aid and scholarships are available through completion of the Free Application for Federal Student Aid. 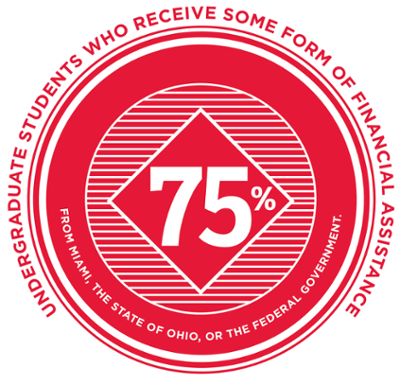 Students must complete a FAFSA each year to be considered for all need-based scholarship, grants, and federal loans. Please note that Miami University Regionals merit scholarships are highly competitive and, thus, not guaranteed.